Yes, when we hear the graveyard music, we often indulge in various expressions of nerd rage. However, there is no denying that there are some cool, funny and emblematic ways to die, both throughout the leveling process and in the endgame. Who has not gotten stomped by the Fel Reaver in Hellfire Peninsula? 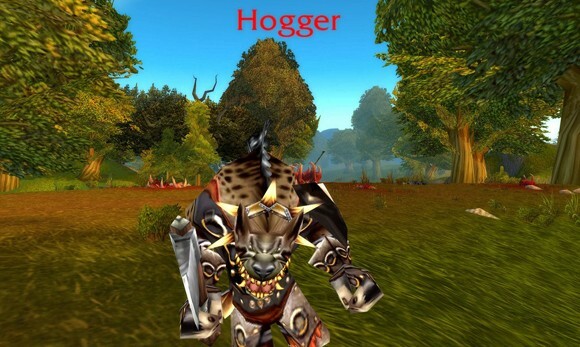 Were you ever pwned by Hogger? And what about all those times when your famous last words were, "I'm a _____. Five levels above me? No big deal ..."
My characters have met their deaths in the elevator of the Undercity, been shot out of the sky near Alliance camps in Outland and steamrolled under various groups of mobs in Stranglethorn Vale. One of my favorite deaths occurred when my husband and I rolled Forsaken toons together. I rolled a warrior, he rolled a rogue, and we had fun roflpwning low-level mobs in our BoA gear. We found our way to Silverpine Forest, and I noticed that one of the nearby worgen had a different skin color than the others. Of course, being the compulsive silver-elite-killer that I am, I immediately targeted the mob, only to discover that it was a gold elite -- a level 20 Son of Arugal. I shouted and we ran, avoiding the mob the first time, only to have it pat up behind us and kill me a few minutes later. Darling hubby got away (stupid rogues -- always run when there's a fight). One of my more shameful deaths occurred after playing chicken with the ground on my level 80 druid. The most exciting part of this game is wondering if there is enough lag at the moment that you click the flight form button that you'll end up dying anyway. I was flying over Dalaran and told my hubby, "Hey, watch this!" As he stood at the bank, I proceeded to fall through the air, expecting to be able to transform into flight form at the last second. Oh wait, fail -- I forgot that you cannot mount up on flying mounts in Dalaran. After he stopped laughing, he was nice and rezzed my splattered corpse. Breakfast Topic: Let's talk about fun ways to die originally appeared on WoW Insider on Mon, 04 Oct 2010 08:00:00 EST. Please see our terms for use of feeds.